Place the can of coconut milk in the refrigerator for 8-9 hours, or overnight. Open the can and spoon out the solid part of the coconut cream. Underneath the solid portion, it will be liquid – don’t scoop any liquid out. Place the cream in the bowl of a stand mixer fitted with the whisk attachment (you can also use a hand mixer). Beat on high for 3-5 minutes until light and fluffy. Add in the sugar and vanilla and whisk another minute. Serve immediately or store in the fridge for 3-5 days. Preheat oven to 350 degrees F. Butter a 9 x 5 x 3-inch loaf pan, then line with one piece of parchment paper (crosswise) so that there is a 2-inch over hang (this helps you pull the cake out after it’s cooled). Butter the parchment paper and sprinkle with a little bit of flour. In the bowl of a stand mixer fitted with the paddle attachment, cream the butter and sugar until light and fluffy, 3-4 minutes. With the motor on low, add the eggs one at a time, mixing between each and scraping the bowl as needed. Beat for another 3 minutes until fluffy. In a small bowl, whisk together the flour, salt and baking powder. In another small bowl, whisk together the coconut milk with vanilla and coconut extract. With the motor on low, add half of the flour mixture to the butter-sugar mixture, then pour in the coconut milk and finally, add in the remaining flour. Mix until just blended, and then stir in the rainbow sprinkles with a rubber spatula. Pour batter into the prepared pan and bake until golden brown on top and a toothpick inserted in the center comes out clean, about 50-60 minutes. Oven temperatures vary! Allow the cake to cool completely on a wire cooling rack. 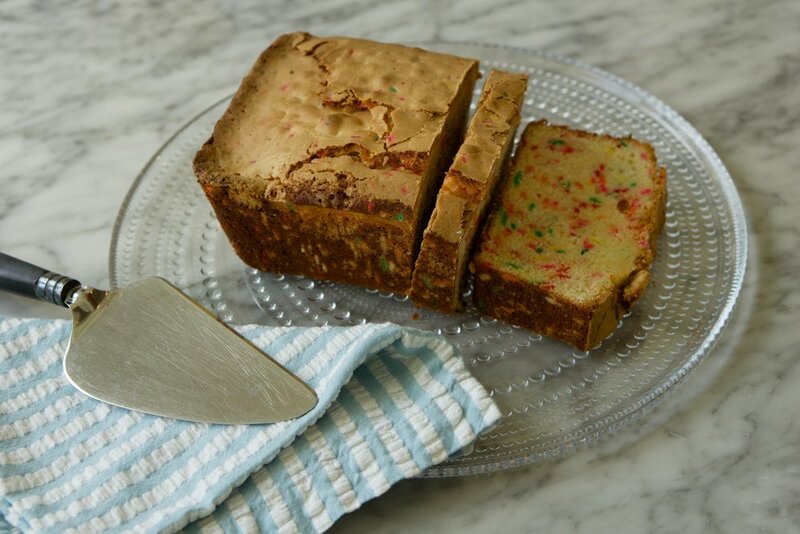 Serve with coconut whipped cream and more sprinkles!